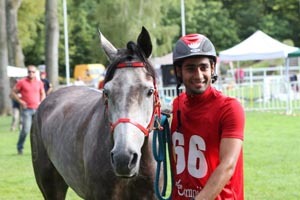 Salman Isa Al Radhi of Bahrain, riding Persepolia Larzac, won the 8 Years Old CEI*** 160 km on Friday 19th August at Compiegne in a time of 8:15.38, averaging 19.44 km/h. Finishing second was France's Sandrine Lance, riding Movisko du Lauragais, in 8:19.20, averaging 19.30 km/h. Spain's Monica Comas Molist, riding Princesse de Campagne finished third in 8:20.05. 20 started and 11 finished. Saeed Sultan Shames al Marri of the UAE, riding Qatar La Majorie, won the 7 Years Old CEI** 120 km on Friday 19th August at Compiegne in a time of 5:39.53, averaging 21.20 km/h. by 3 seconds. Tomas' riding time was 5:44.25, averaging 20.92 km/h. 40 riders started and 23 finished. Sunday is the Sponsor's Trophy CEI** 130 km Nations Sponsors Trophy. 130 are expected on the starting line.